Photographer Lauren Greenfield isn’t hesitant about shining a camera on out-of-control materialism and consumerism, themes she continues to explore in her latest show at the Annenberg Space for Photography in Los Angeles. “I had this flash in 2008 when I was making [the documentary] ‘Queen of Versailles’ and I looked at the crash in California to Dubai to Ireland to Iceland and when I saw it hitting this billionaire family I just realized there was something about human nature in this environment where we had all kind of made the same mistakes. 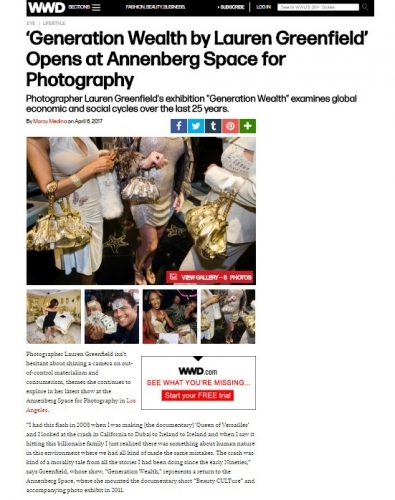 The crash was kind of a morality tale from all the stories I had been doing since the early Nineties,” says Greenfield, whose show, “Generation Wealth,” represents a return to the Annenberg Space, where she mounted the documentary short “Beauty CULTure” and accompanying photo exhibit in 2011.